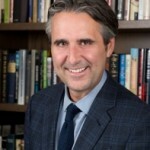 John Della Volpe is the Director of Polling at the Harvard Kennedy School Institute of Politics, where he has led the institute’s polling initiatives on understanding American youth since 2000. The Washington Post referred to John as one of the world’s leading authorities on global sentiment, opinion and influence especially among Millennials and in the age of digital and social media. In 2008, he received an Eisenhower Fellowship for which he traveled extensively throughout China, Hong Kong, and Korea (including a supervised day in North Korea) studying Millennials; in 2011, he was appointed to the U.S.-Russia Bilateral Presidential Commission on Media. John is also founder of SocialSphere, a Cambridge based public opinion and analytics company. He serves on the Board of Trustees of iCatholic Media, the Ad Club of Boston and is a member of the Global Alumni Council for Eisenhower Fellowships. John appears regularly on MSNBC’s Morning Joe and his insights on the Millennial generation are found in national media outlets in the U.S. and abroad, including the Daily Show with Trevor Noah.